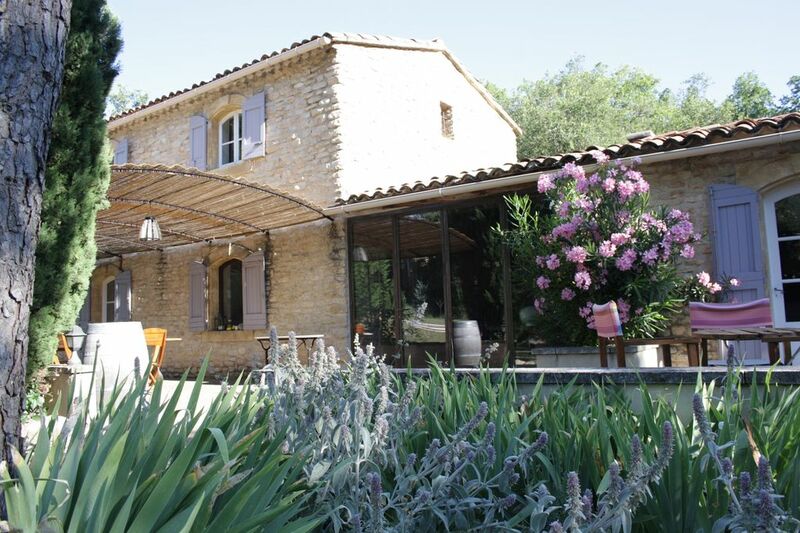 A 3 km from the city center, in a quiet environment, charming villa with pool (8x4m) on 4000m² of land, large terrace overlooking the village of Saignon, 2 spacious bedrooms, 2 bathrooms and possibility extra beds for children in an alcove in the living room. This is a typical Provencal villa, made of thick stone walls, a large bay in wrought iron overlooking the south terrace. The ancient terracotta floors, the size stone fireplace adorns the living room and traditional plaster walls gives a lot of charm to the house. The bathroom on the ground floor has a tiled shower stone, a toilet and a sink. The bathroom upstairs with a large shower and 2 sinks, under a ceiling canisse and view overlooking the pool and garden. The toilets are separated from the floor of the bathroom. We really enjoyed stay in Jean Michel house. House is in great place above Apt, with beautiful view. Clean, comfort, with everything you need for cooking...and dog friendly :) thank you Jean Michel for great week in Provence! Thank you so much for your coming, we did appreciate a lot your kindness and your tcheq alcohol too!!! Haus mit wundervoller Atmosphäre und sehr guter Aufteilung. Toll ausgestattet und "deutsch"-supersauber. Großes Grundstück mit sehr schönem Blick auf Saignon und direkt vom Haus aus Anschluss an diverse Wanderrouten. Total unkompliziert mit Hunden und sehr nettem Gastgeber. Danke, Jean-Michel. Sehr schönes Ferienhaus in toller Lage! Wir hatten eine traumhaft schöne Woche hier, gute Ausstattung, sehr geschmackvoll, man fühlt sich sofort zu Hause. Sehr netter und unkomplizierter Vermieter. Magnifique endroit boisé dans les hauteurs d'Apt. Belle maison de caractère, spacieuse et bien équipée, avec piscine et grand terrain herbeux. Belle vue sur le village perché de Saignon. Merci à M. ETIENNE pour son chaleureux accueil.